Few topics have proven to be more sensitive online than the present state of Fukushima Prefecture. Years after the earthquake, tsunami and nuclear disaster wreaked havoc in the region, the topic of radiation continues to spark intense debate from all corners. A statue that was unveiled in the prefecture last week has just added plenty of fuel to the fire. 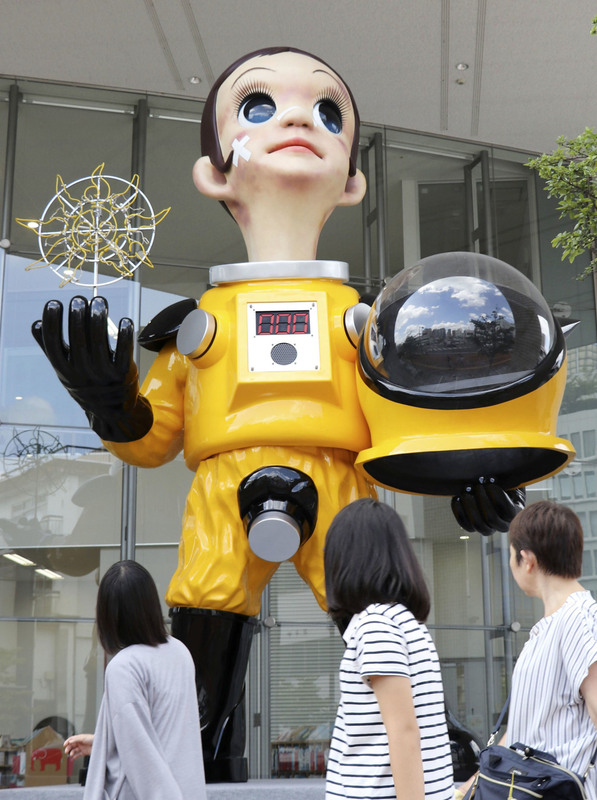 The statue was inspired by the Fukushima nuclear crisis. It debuted in 2011, traversing the country (including Fukushima’s airport in 2012) and generally attracting a positive reception. Even while it was being assembled in its new home, people snapped photos of it and remarked how “cool” it looked. However, people’s views regarding the statue began to fragment after it was officially unveiled on Aug. 3, with debate intensifying last week. 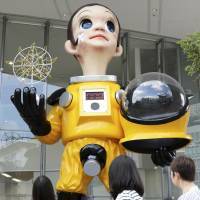 Fukushima residents started to post negative comments about the statue after a local news organization published a short story on it. Some argued that it was too soon to erect an artwork along such lines in a city still recovering from a nuclear crisis, while others noted that it was scaring children. Yanobe had created the statue to celebrate a nuclear-free future, but it ultimately had the opposite effect and reminded people that this was still far from reality. After a few days, the issue started to get picked up by national and international news outlets. The questionable science behind the artwork was frequently brought up, with many arguing that natural radiation alone would prevent any counter from hitting zero, among other complaints. Many netizens were simply irked at the inclusion of the hazmat suit, arguing that such imagery was misleading. As serious as all of this sounds, let’s take a quick detour to talk about another aspect of the statue that captured the internet’s attention: its crotch. While plenty of discussion on message boards such as 2chan focused on the lasting impact it could have on the local economy or the general challenge of creating art that has been inspired by tragedy, many zeroed in on the tap extending from the front of its trousers. It carried over to Twitter, too, with one user wondering how effective the statue could ever be if schoolkids were distracted by the contents of its nether regions. Coupled with other jokes and references, it’s a good reminder that memes will always be created online, whether or not the issue is particularly sensitive. Some of the discussion online focused on the art itself. Yanobe’s “Sun Child” has to date been largely been celebrated by domestic art critics. Anti-nuclear pieces have been central to Yanobe’s work since the early 1990s — he even went to Chernobyl and documented the fallout from the nuclear disaster there. By placing his art in the heart of a place that was affected by a nuclear accident, Yanobe changed the way people viewed “Sun Child.” Once the mystery had been stripped from his work, ordinary folks introduced new interpretations, with some slamming the idea of someone hiding behind “artistic license” to dodge criticism. Fukushima Mayor Hiroshi Kohata claimed the artwork reflected an optimistic view of the future, but noted that art, unlike science, can sometimes be abstract. This latter point, though, has become a tricky matter at times when the majority of conversation online feels reactionary, and not just in Japan. Some of the opinions voiced about “Sun Child” centered on the challenge of creating political art that doesn’t offend (this is the closest to a real defense of the statue I’ve seen). Others said it might have looked better if Yanobe had actually spent more time in Fukushima, instead of simply “making a cup of tea and leaving.” For his part, Yanobe apologized. Part of the reason the statue has attracted so much attention online is that Fukushima’s radioactive status remains contentious. A number of sites aim to dispel myths surrounding the perceived lack of radiation safety in Fukushima. Twitter user @nonbeekaeru takes the opposite approach, arguing that radiation is traveling around the world and could envelop the 2020 Olympics or poison K-pop stars. As an example, check out the new Netflix show “Dark Tourist,” which features an episode about Fukushima that paints the prefecture as a nuclear wasteland. Indeed, this is the real reason this statue has caused a stir online: It’s another reminder that what happened in Fukushima actually lingers over the whole country and continues to shape the way in which people see the prefecture. With social media, though, locals can counter such misinformation, whether or not they use art to do so or not.